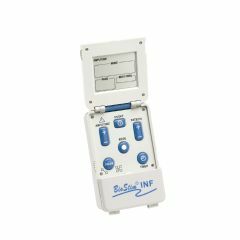 BioMedical Life Systems is proud to announce the newest generation in its Interferential Device line, the digital BioStim Interferential Device. Three pre-programmed sweeps; 1-10 Hz, used for Edema Reduction, 80-150 Hz used for Pain Relief and 1-150 Hz for total treatment allow for easy set up and patient instruction. The Device offers bipolar stimulation using two electrodes where the interferential stimulation is already "mixed" or Full Interferential stimulation with the use of four electrodes. The device has a timer for the desired treatment time and operates from four AA batteries or the BioStim Wall Adaptor. Four Frequency Shifts: Continuous, 1-10 Hz over 6 seconds and 80-150 Hz over 8 seconds and 1-150 Hz over 10 seconds. This was my first order with Allegro Medical. The product arrived on time and it worked well. Thanks for your quality products and great service! I used this product on my knees once a day for 3 days of using and the pain was completely gone for several weeks what the pain starts up again I only need to use it once and is gone again for several weeks I love it so much I bought one for my friend. AC adapter is great. The device consumes AA batteries rather quickly - it is a powerful unit. It reaches the myofascia on deep muscles very well. Does this unit come with the wall adapter or do you have to purchase that separately?